An adult male elephant was shot dead and its flesh cut away in a reserve forest in the Assam state of India recently. 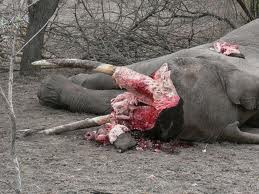 Poachers also beheaded the elephant and took away its trunk, tusks and limbs before escaping from the forest. It is said that three people sneaked into the forest and shot dead the elephant and cut it into pieces. In another incident, poachers killed a female rhino in another national park in India. These unfortunate incidents have happened because of the failure of the forest department officials. Most of these officials are corrupt and let poachers into the forest to go on a hunting spree of innocent and harmless animals. They are hand in glove with the poachers and are on their payroll. The government must take stringent action against these corrupt officials and must ensure the safety and well-being of our animal friends. For years, innocent animals are being killed and their body parts being smuggled out of the country in order to make money. This has become a thriving business for poachers who have a very strong network of people working for them including government officials. Apparently, everybody wants to be a part of the gravy train. However, this mindless violence against animals must be stopped imediately. The government must take steps to curb this menace and should make stict laws to end the brutal murder of animals. The civil society too has to play an important role by raising their voice and force the lawmakers to make such laws. We all must remember that if the animals of the planet will vanish, we will vanish too.